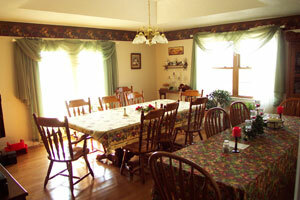 Come to Grabers Green Gables Bed & Breakfast in Odon, Indiana, for a getaway to remember. 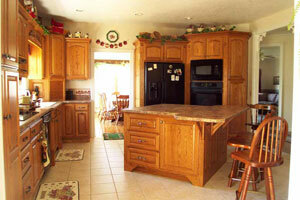 Our bed and breakfast inn is your cozy home away from home on a beautiful 13 acres of countryside. You'll be enchanted by our 6,400-square-foot home full of old-world charm and grace. Our private rooms with private baths are available year-round, so contact us today. 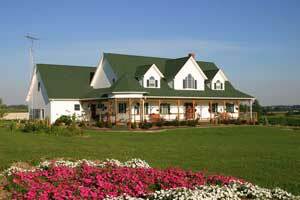 Grabers Green Gables Bed & Breakfast isn't your ordinary inn. We offer spacious living space as well as outdoor entrances to each room for the ultimate in seclusion and privacy. We offer a free hearty country breakfast to start your day and when, where, and the types of food you're served is entirely up to you! And when you feel like staying in to relax and curl up with a good book, we have a library on the main floor connected to a spacious and breezy deck that surrounds the entire home. You may not want to leave!